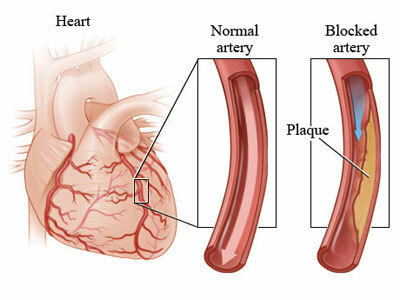 Coronary artery disease (CAD) is the most common type of heart disease.CAD happens when the arteries that supply blood to heart muscle become hardened and narrowed. This is due to the buildup of cholesterol and other material, called plaque,on their inner walls. This buildup is called atherosclerosis. As it grows, less blood can flow through the arteries. As a result, the heart muscle can't get the blood or oxygen it needs. 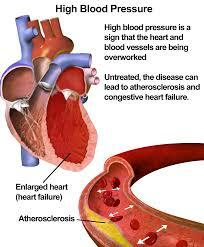 This can lead to chest pain (angina) or a heart attack. Most heart attacks happen when a blood clot suddenly cuts off the hearts' blood supply, causing permanent heart damage. Cardiac arrest(CA)is a condition in which the heart suddenly and unexpectedly stops beating. If this happens, blood stops flowing to the brain and other vital organs. CA usually causes death if it's not treated within minutes. Usually, the first sign ofcardiac arrest (CA)is loss of consciousness. At the same time, no heartbeat can be felt. Cardiac arrest(CA)is an emergency. A person having CA needs to be treated with a defibrillator right away. This device sends an electric shock to the heart. The electric shock can restore a normal rhythm to a heart that's stopped beating. 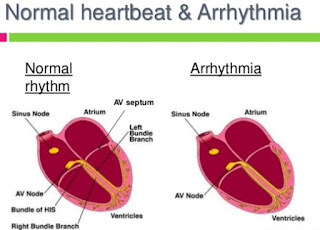 An arrhythmia describes an irregular heartbeat - the heart may beat too fast (tachycardia), too slowly (bradycardia), too early (premature contraction), or irregularly (fibrillation). b).Ventricular aneurysm surgery-sometimes, an aneurysm (bulge) in a blood vessel that leads to the heart causes an arrhythmia. If other treatments do not work, a surgeon may remove the aneurysm. c).Coronary bypass surgery-arteries or veins from elsewhere in the patient's body are grafted to the coronary arteries to bypass any regions that have become narrow, and improve the blood supply to the heart muscle (myocardium). a).Headache - usually, this will last for several days. b).Nausea - a sensation of unease and discomfort in the stomach with an urge to vomit. c).Vomiting - less common than just nausea. d).Dizziness - Lightheadedness, unsteadiness, and vertigo. e).Blurred or double vision (diplopia). g).Palpitations - disagreeable sensations of irregular and/or forceful beating of the heart. h).Dyspnea - breathlessness, shortness of breath. 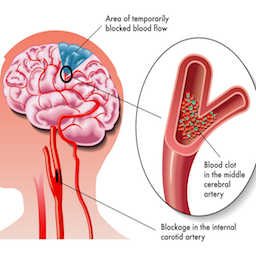 Strokes occur due to problems with the blood supply to the brain: either the blood supply is blocked or a blood vessel within the brain ruptures, causing brain tissue to die. d).Trouble with walking, including dizziness and lack of co-ordination.